BANGKOK, Thailand, October 25, 2011 (ENS) – The Thai government has called a special five-day public holiday October 27-31 due to the worst flooding in more than 50 years. 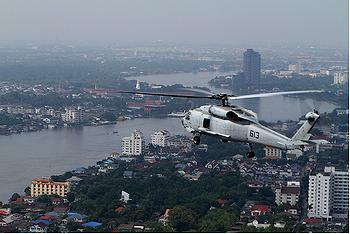 Waters are rising in Thailand’s flood-prone capital city of Bangkok, which lies near the mouth of the Chao Phraya River. The holiday in the capital Bangkok and 20 other provinces along the Chao Phraya River is intended to let people to prepare for further flooding, as unusally high tides are expected on the weekend. The holiday decision came Tuesday at the Cabinet’s weekly meeting at Bangkok’s Don Mueang Airport, the location of the government’s Flood Relief Operations Centre. Encroaching floodwaters have covered some runways, forcing the airport to suspend all flight operations Tuesday for the safety of passengers, said airport officials. The airport closure is expected to last for at least a week. Flood control operations continue inside the terminal buildings, and the Flood Relief Operations Center will remain open. No problems are reported at Bangkok’s other airport, Suvarnabhumi. About 4,000 people taking shelter at Don Mueang Airport were evacuated Monday to a location on higher ground in Chon Buri. Waters are rising in Bangkok and Prime Minister Yingluck Shinawatra warned that floodwalls and embankments might give way, allowing the water to enter the central and inner zones of the capital. The high tide has caused the Chao Phraya River to rise 2.4 meters (7.8 feet) above sea level, which is over the maximum height of the water barrier along the river. In office just over two months, Yingluck said her government will work with the Bangkok Metropolitan Administration to minimize the water levels by opening all sluice gates in the capital. The BMA already has moved electrical control units of the sluice gates to higher, safer ground. Yingluck said the BMA will work with the Thai Highways Department to build a three-meter-high floodwall stretching about 39 kilometers to protect the east section of Bangkok. The Prime Minister pledged to invest in long-term prevention projects, including the construction of drainage canals. People on the opposite sides of flood barriers have been fighting over flood control measures. Those on the flooded side sabotage the barriers, sometimes taking up arms. Four days ago, for instance, a mob on the flooded Don Mueang side of the Khlong Prapa Canal north of Bangkok seized control of a tractor and destroyed part of a new dyke built along the canal to keep the water out of the municipality of Pakkret. The destroyed section of the dyke was sealed later that night after the intervention by a Member of Parliament with personal phone message from Prime Minister Yingluck. But pump out of the resulting flood took crews two days. Opposition leader Abhisit Vejjajiva and military leaders are urging Yingluck to declare a state of emergency, claiming that it would give the military greater authority to deal with embankment sabotage. A state of emergency was last declared in 2010 during the Abhisit-government’s crackdown on anti-government protesters. Yingluck declined to impose a state of emergency, saying that it would not improve flood management. Instead, she invoked the 2007 Disaster Prevention and Mitigation Act and issued a disaster warning, which gave the government greater authority to manage flood control and drainage. She charged the armed forces with maintaining and defending the dykes and levees. The military is also responsible for protecting key installations, including the Grand Palace, Siriraj Hospital, the tap water system, and the Suvarnabhumi and Don Mueang airports. Bangkok Governor Subhumbhand Paribatra is advising residents of Don Mueang and five other districts to move to higher ground. The most vulnerable citizens, including the elderly, patients and children, should be evacuated to temporary shelters provided by the local authorities, he said. Several canals and the Khlong Prapa have returned to normal, said the governor. 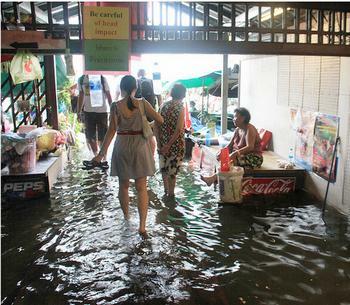 The Lak Si District has been cleared of the flood while the Don Mueang District is still affected, he said. In a statement today, Governor Subhumbhand called for residents to cooperate with government efforts. He stressed that since the beginning of the flooding all BMA personnel have “worked very hard” to relieve the hardship of Bangkok residents. There are currently an estimated 100,000 people suffering from flood-related stress, so Public Health Minister Wittaya Buranasiri has ordered the establishment of health units to help ease psychological and emotional stress. The units are operating in 30 evacuation centers in four provinces. 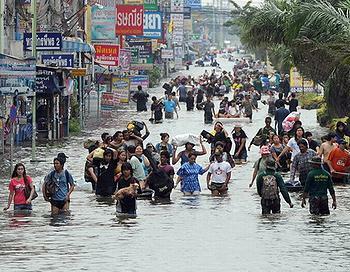 The Malaysian government has donated 30 million baht to help flood victims in Thailand. On Monday, Malaysian Foreign Minister Dato’ Sri Anifah Haji Aman on handed over a cash sum of US$1 million to Prime Minister Yingluck at the Flood Relief Operations Center. The U.S. government has extended aid worth 18 million Thai baht (US$585,000) to help the Thai government deal with the flood crisis. Provided through the International Organization for Migration, the funding will allow the Thai Department of Disaster Preparedness and Mitigation to purchase water pumps, generators, water purification units, boats, motors and life vests. Since late July, the monsoon floods have caused at least 300 deaths, and more than 2.5 million people are affected. Flood damage estimates now stand at US$6 billion.